The meteorological data is the starting point of the evaluation of a project. This help section will guide you in different options, for discovering the management and organization of meteorological data in PVsyst. It is very much advised to fully read our Notes on Meteo. They contain important guidelines: remember that meteo is the main source of uncertainty. 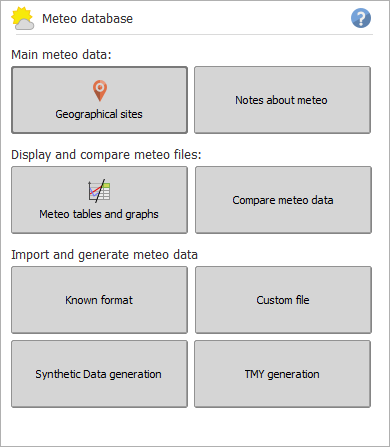 Within the Meteo Database help section, you have at anytime the possibility to go directly to those notes by following the link on the top of your current page. A good start is to read our note on Monthly & Hourly meteo files in PVSyst.